I am pretty new to gardening. I only plant perennials. I have had some difficulty figuring out what a particular cluster of foliage is. The only things that have been planted in this area are Shasta Daisies and Summer Phlox. The shatsas werent looking great last year, so not sure if they will come back or not. Can someone tell me what are the 2 plants (or weeds) in this picture? Great question, but i know I've pulled both and treated them as weeds. I hope you find out they are a nuisence, or I will have been badly mistaken. 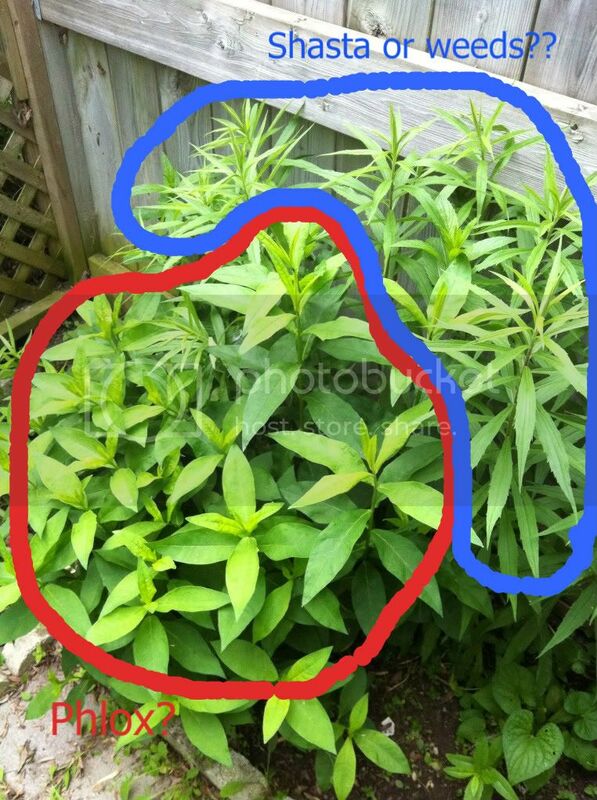 Red circled ones do look like garden/summer phlox. The blue circled ones remind me of goldenrods. I am almost sure the red is summer phlox. The other, like I said, not sure....the only thing it could be is shasta daisy....if that can be definitely ruled out, then they are weeds, and I'll pull them! I'm about 99.9% sure that it's a daisy, Shasta not sure. Here's a picture of my Shasta daisy.